I never set out to collect cups and saucers, my collection found me. When I was a little girl and we had afternoon tea, my Mom would let me choose the cup I wanted to use from her own collection. This selection could take some time, and was definitely half the fun. Most of Mom’s teacups had belonged to someone else first, and they all had a story. From the Limoges cup and saucer from my Grandma’s best set of china, to the fragile Irish Belleek cup covered in shamrocks, they were all little pieces of my family’s history. I wish I had written the stories down. I remember some of them. My first teacup came to me when my best friend’s Nana passed away, as something to remember her by. My Grandmas had both died before I was born, and my friend had offered to ‘share’ Nana with me so I wouldn’t be Grandmother-less. Nana, who was lovely, never seem to mind. Some years later, when my beautiful, vivacious Aunt Irene died, my cousin gave me this teacup to remember her by. Over the years I received a few teacups as gifts and when I moved to England my mom began to share her collection with me. When she died the few remaining pieces came home too. I’m not quite sure how many of them there are, and while some of them are on display, the majority spend far too much time in the cupboard and sideboards for my liking. A few weeks ago, a woman who I had met only recently, but who was one of those people who have a profound influence on you in a very short time, and of whom you are somehow instantly fond, passed away. She was barely two years older than I am. Oddly, it made me think of the teacups. Seriously, what – or indeed when – was I saving my good china for? 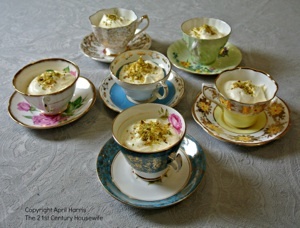 Since then I’ve looked for opportunities to allow my cups and saucers to see the light of day, and while I’ve made this Turkish Delight Syllabub before, I fancy it has never tasted as good as it did in these beautiful tea cups. Faces lit up when I brought them to the table at my latest dinner party, and they were a wonderful talking point too. Flavoured with rosewater, orange, lemon and mint, Turkish Delight is a jelly-like sweet. The individual squares are dusted with powdered sugar. They were a favourite of my mom, and of her mother before her. Perhaps not surprisingly, I love Turkish Delight too. Syllabub is traditional old English dessert, forms of which date back to the seventeenth century. 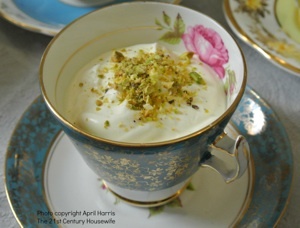 This Turkish Delight Syllabub recipe is from the inimitable Nigella Lawson. I have toned down the flavourings a bit, reducing them by half, leaving the cream with just a hint of the flavours of the east. The bright green pistachio rubble on the top provides a welcome contrast to the pale cream, and a little bit of very welcome crunch. Combine the Cointreau, the juice of the lemons and the sugar in a large bowl. Stir to dissolve the sugar. Don’t rush this step as you want the sugar to be fully dissolved. Add the rose water and orange blossom water. Whip the cream some more, until the cream just reaches the soft peak stage. This is when, if you lift the beaters, the cream forms soft peaks. Be careful not to over-whip as you don’t want the cream to be too firm. 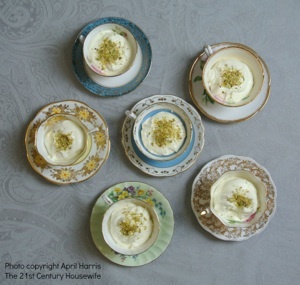 Spoon the syllabub gently into teacups or serving dishes of your choice (preferably the ones you have been saving at the back of the cupboard for special occasions). Scatter the pistachio pieces on top. Keep the syllabub in the fridge until serving time. You can make them a few hours ahead. It’s a good idea to cover the serving dishes with a bit of plastic wrap if you are going to chill them for long. It goes without saying, but if you do use cups and saucers, simply put the teacups themselves in the fridge and leave the saucers stacked on the side until serving time to save space. I thoroughly enjoyed reading about your tea cup collection! It brought back memories of tea parties with my grandmother. I also had the hardest time picking which cup to use. I love the idea of serving dessert in a tea cup what a fun, yet elegant presentation. Thank you, Alea. I’m so pleased this post brought back happy memories. All of your china is so beautiful – what an amazing collection! And this syllabub is the perfect complement! I love your new look…and most of all, I love that I can leave a comment! Just wanted you to know that I am featuring your dessert on foodie friday. Thank you so much for being party of our food party…. and yes, it is terrific to be able to leave a comment. Love the new blog. Thank you so much for the feature, Diane, and for the compliment! This is such a wonderful story! I too collect teacups and I try to use them as often as possible. There’s no use keeping them hidden away! Thanks so much for sharing this at this week’s Say G’day Saturday party. I’ve just shared this on Pinterest, Twitter and Facebook. Your china is beautiful April 🙂 Thanks for sharing at Share your Stuff Tuesdays!